We strongly emphasize the importance of using knives safely. Teach a kid about knives as tools! Kids and Knives– Introducing young people to knives involves parental guidance and familiarity with the important aspects of ownership. See the article below. My First Knife | (PDF Version) – Tips on Safety, Use, Maintenance, Sharpening, and Outdoor Ethics. Contact us to request print copies to share and be sure to include your mailing address. 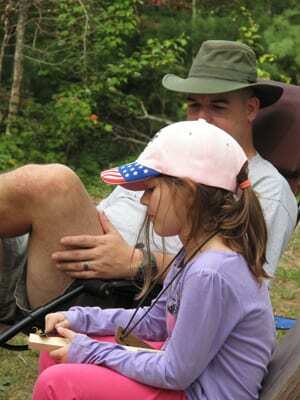 Introducing young people to knives involves parental guidance and familiarity with the important aspects of ownership. A.G. Russell sharing with a friend. The knife is one of the world’s oldest tools. It is practically indispensable in daily living. Every home has one – either in the kitchen, the work room, or the desk drawer. Introducing children to knives may be a challenging proposition; however, it is a necessity, and responsible adults can make the process a worthwhile learning experience. Several considerations weigh in when a parent or adult considers allowing a child to handle a knife, and the most basic of these involves the appropriate age. Such a decision comes above any other, and the elements of safety, appropriate usage, care and maintenance, and others subsequently fall into line. Of course, the appropriate age to place a knife in the hands of a child may vary, depending on the individual and the circumstances. Becky Reid, co-owner of Shepherd Hills Cutlery, a major dealer of housewares including Chicago Cutlery and with a primary emphasis on Case Knives with four locations in Missouri and Kentucky, has organized and hosted Camp Case, an hour-long program for kids ages 6-16 to learn about knives and their proper use, since 1997. The legendary A.G. Russell remembers his first knife experience at the tender age of five. That knife was lost for more than a year, and he recommends waiting a little longer to give a knife to a child these days, considering the issues surrounding appropriate places to carry and use such a tool. 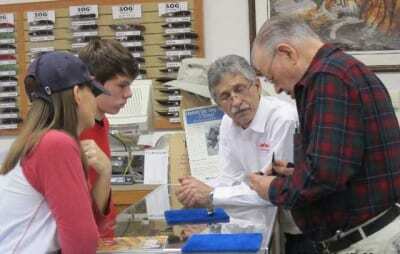 Kids learning from experts Dan Weidner, President Boker USA (left) and A.G. Russell in the A.G. Russell store. 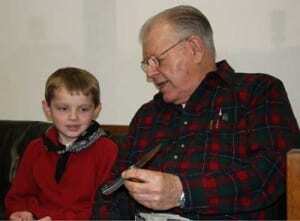 “My kids were six or seven years old when they got their first knives,” said Russell, “and the present generation probably should not have knives until they are at least seven or eight. I see too many incidents of kids slinging knives around irresponsibly. It is important to explain to a kid just how easy it is to cut yourself with a knife and that if they do cut themselves that they should tell an adult. When a young person is ready to own a knife, Russell recommends that the parent or responsible adult consider a modest purchase for that first tool. He suggests that something basic, such as the Swiss Army Soldier, which includes 10 implements, may be practical. A reasonable investment of about $30 is adequate. Since its inception, AKTI has been prominent in the effort to educate young people in the safe enjoyment of knives. Billeb observes that as soon as a child starts helping with the dishes or eating with a knife it is a good time to talk with them about knife safety and care. AKTI also stresses that each parent must decide when it is appropriate to allow their child to handle and care for knives. The Camp Case model has proven successful at Shepherd Hills Cutlery, providing a learning experience in an atmosphere of safety and fun, while young people interact with experts in the field and with their own family members. 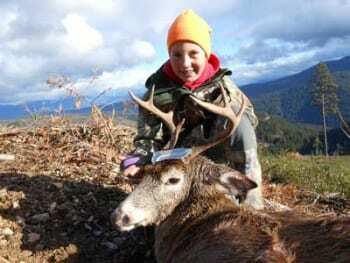 Hailey from St. Maries, ID with her Buck Haley Health skinner (12th birthday gift) and with her first white tail deer. Knives are a common, everyday tool in the home. Like any other implement, they must be handled safely and competently. Providing young people with the knowledge and experience necessary develops skills that will serve them well as adults.